The Kvarner region is an attractive region that includes the islands of Cres, Krk and Rab, and the mainland on which the city of Rijeka can be found. Its mild climate, location on the Adriatic coast and natural beauty have made it a popular holiday destination. Kvarner and the Highlands have been ruled by Croatian monarchs since medieval times, so Croatian culture is particularly strong here, and historic sites are plentiful, such as forts, palaces, churches and abbeys. Due to the region’s increasing popularity, modern tourist developments are on the rise. The island of Krk is highly developed and densely populated. It has excellent tourist infrastructure and holiday homes and hotels continue to be built. It presents a great potential in property investment. Rijeka is Croatia’s largest and main seaport. The city’s economy is driven by sea transport and shipbuilding in Kvarner Bay on the Adriatic coast. Rijeka is an industrial city and not a tourist destination. It has only a few significant old buildings, as many were destroyed during an earthquake in 1570. Ornate, public buildings displaying a strong Austro-Hungarian influence dominate the largely concrete centre, while modern apartment blocks tower along the crane-filled harbour. What may stir some cultural interest are the National Croatian Theatre and the Cathedral of St Vito. A favourite local hangout is the tree-lined harbour promenade, Korzo. It is the main commercial avenue and the focal point of the city’s café culture. The most interesting event in the city is the Carnival, the world’s third biggest carnival after those of Rio de Janeiro and Venice. Rijeka serves as a transit point and has road and railway connections to other Croatian cities and direct trains to Vienna, Munich and Salzburg. Krk is Croatia’s largest and most populous island. Situated in the northern Adriatic Sea, its coastal terrain varies: steep and almost barren in the northwest where the winds are strong, and lushly vegetated in the southwest where the climate is gentler. Inland, rich fields meet stony hills. Krk is the exact size as neighbouring island Cres. A bridge connects Krk to the mainland. It has good transport connections, including Rijeka International Airport. Krk is overdeveloped and not the most attractive of the Croatian islands. But it has a long history of tourism, long-visited by Austrians, Germans and mainland Croats. 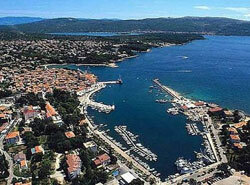 In the southwest are the island’s major towns of Krk and Baška and its most popular beaches and coves. Krk’s charm lies in its old quarter, encircled by medieval walls. Sections of the ancient Roman city are still visible, and the early-Romanesque cathedral built in the 5th century still stands, though it has acquired various styles through the years. 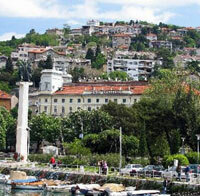 A popular gathering place in Krk is the waterfront promenade, with its restaurants and cafés. Modern developments here are concentrated in the surrounding hills and beaches. Holiday homes, hotels, and camping sites compete against each other for space. Nestled at the foot of a mountain range, Baška is the main beach destination on the island. Four-star hotels and luxury villas face the wide and white sandy bay. Another frequently visited resort is Soline Bay, known for its healthy mud. Near Soline is Cizici, where a new luxury development near the sea is under construction. It consists of 5 buildings with 6 luxury apartments each. 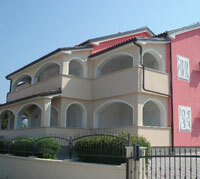 Real estate properties in Krk Island are mostly family homes, vacation apartments and construction sites. Rab is a largely green island in the Adriatic. Hills and valleys share its interiors, while pine woods spill over the lovely sandy coast on the densely populated southwest. The island’s best beaches are found in the northeast along the Lopar Peninsula, while coves take over the northwest. Rab has a mild Mediterranean climate as Kamenjak, the highest range in the island, blocks the cold northeast winds. Vineyards and olive groves cover a significant portion of the island’s arable land. Its shallow beaches and pleasant climate have long inspired tourists to visit Rab, even during Croatian War of Independence in the 1990s. The medieval town of Rab is traversed by steep and narrow roads that lead to lovely churches and red-roofed buildings and houses. Four bell towers are the famous landmarks here. Rab’s resorts and campsites are found in Padova I, Padova II and Padova III. A long and narrow strip of land off the northern tip of Kvarner Gulf, Cres is the largest Croatian island along with its neighbour, Krk. (Interestingly, they are both 405.78 square kilometres in size.) This mountainous island is strewn with hidden coves and pebbly beaches in the south and west, and covered with oak and chestnut woods in the north and east. The main town, Cres, is on the western coast. Along the narrow streets of this medieval port town stand Venetian mansions, pastel-coloured terrace houses, and shops, bars and restaurants. Its marina has been awarded a Blue Flag label for the good quality of its water. A narrow bridge connects Cres to the smaller island of Lošinj. The two islands share their main source of drinking water, the deep freshwater Vrana Lake.